EKK Week 2 Wrap – Who’s Coming Up on Monday, February 1? Who’s Coming Up on Monday, February 1? Jody Ascuena, our local Hawaiian-speaking Brit from Newcastle, England and an avid student of Hawaiian language in her present life, was still in 7th heaven the morning after the EKK performance by the Niihau contingent. “I was transported! I don’t know where I was transported to but it was wonderful!” Teary-eyed and red-faced, she was recollecting all her favorite moments of the performance by the Triple Ts plus two Niihau `ohana at EKK. It was a rare opportunity for residents and visitors to get to see them perform. 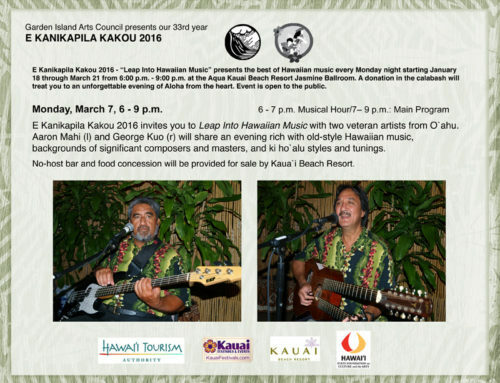 Their young nephew, John Austin Keiki`aloha Kaohelali`i, opened the program with his musical debut playing the baby grand piano, his favorite of the 16 musical instruments that he is able to play at this stage of his 17 years. Since this was his first solo public performance, he was extremely nervous so he scripted the entire performance right down to the audience reaction, writing, “…And when the applause dies down…” and the hokey but hilarious joke he interspersed for a little comedy (that’s what performers do, I guess). I looked at his notes and thought to myself, this looks like a two-hour program, but he hit it right on the head and charmed the audience for 40 minutes, the exact time I allotted him for his opening segment. Three hymns or himeni, self-accompanied on the `ukulele, were his opening numbers, but the rest of the performance was a delightful selection of piano favorites which he played while narrating his story of how he came to be playing the piano Hawaiian style without any sheet music. EKK being his solo debut for the public, Keiki was not a seasoned performer, but he managed to deliver a solid performance full of humor and superb mastery of the piano, which he has been playing now for almost two years. When I think about my own six agonizing and futile years of piano lessons (more agonizing for my teacher than for me), I could not believe my eyes and ears at his performance. Keiki described the day that he was born as if he were a fly on the wall witnessing the entire momentous event. His Mama did not know what to name him so, “I was pretty worried about that,” he comments. Luckily, Great Grandpa came to the hospital and sang to her Jesus Loves Me or Ke ike Aloha. His mom heard it as “Keiki Aloha” or “child of love,” thus he left the hospital as John Austin Keiki`aloha Kaohelauli`i. Flash forward to the present where he is a senior at Ke Kula Niihau O Kekaha. As a volunteer art resource teacher at KKNOK, I met Keiki when he was six years old. He was unforgettable as the colorful May Day King along with a delightful court of primary grade students all dressed in full May Day regalia by their aunties and uncles. So full of energy, this precocious little boy king was ready for moi moi (sleep) by the time the procession began. This precociousness and larger-than-life personality has been Keiki’s signature style along with his immediate mastery of just about anything that you could throw at him. Still, it was a surprise for me to show up at his house and find him sitting in a little lean-to shack in the yard with his young buddies playing jazz on the clarinet like he was in a smoke-filled pub. Besides his favorite clarinet, he plays alto/soprano saxophone, violin, trumpet, cornet, trombone, ocarina, flute, harp, upright bass, steel guitar, concert ‘ukulele, harmonica (prisoner’s tune finder), melodica (the piano-like side of the accordion) and accordion (what everyone thinks a French person plays). Tonight at EKK he chose to concentrate on playing the baby grand piano in the colorful style of the Hawaiian aunties who used to pound out song after song at Hawaiian parties. Such a rare sight today. He titled his piano segment “Centuries and Decades,” and while he kept up a humorous commentary of his recent development in piano-playing, he played lively snippets ofChopsticks, Beethoven’s Fur Elise, Scott Joplin’s The Entertainer, Five Foot Two, Eyes of Blue, Habonero, La Cucaracha, and a couple of Hawaiian mele for his family. He later also played Somewhere Over The Rainbow, Kaulana Na Pua, Aloha Kaua`i,Makalapua, and Aloha ‘Oe. Keiki feels that playing the piano does not have to always be so serious; he sometimes annoys the performers who are coming up next because after they so carefully tell him what to play for them, he will surprise them by inserting “the taps” or something unexpected and risqué. However, when the song calls for him to play it properly, he respectfully tries to play the song as it was meant to be played. This was evident when his aunties came up to take the stage because he was very sensitive to the songs they were singing and added the piano accompaniment as a background where it was okay and refrained from playing the piano when it was not appropriate. It was amazing to sit and watch his emotional and sensitive style of playing. By the way, Hi`ipoi portrayed Queen Emma at the annual Festival in the Queen’s honor held in the uplands of Koke`e. Each year for the past 27 years, one woman has been selected from all Hawai`i nei to bring alive the pageantry of the day in a gathering in the Kanaloahululu Meadow at Koke`e. Having spent many years at Ke Kula Niihau O Kekaha where these girls were schooled, I saw them singing all the time in both formal and informal situations. In fact, I believe they sing more than they talk; it is very much who they are and how they grew up. “We were inspired and taught by our grandmother,” Tutu Mama Ane Hi`ilani Kelley Kanahele, a two-time Na Hoku Hanohano Award winner with her `ohana as composer ofhimeni, or Hawaiian hymns. Mama Ane is also a Kaua`i Living Treasure, designated as such by the Kaua`i Museum. The girls have also been composing and singing many of their own original songs. They love reggae. They led off with Ho`omaika`i dedicated to “Aunty Carol” followed by a song for Mama Ane, Iesu E Komo Mai by Kuana Torres Kahele. Two years ago, Tana, the youngest of the three sisters, composed a song when she was given a house in Niihau. Speaking with a great deal of emotion, she shared that it was important to step back and really take a look at what God did for her. Sitting on the lanai of her house, she gazed at the sky and shooting stars as there are no lights on Niihau, and this song came to her. She led the vocals on Keeper of My Soul with the rest of the group harmonizing and singing in parts … so spontaneously and naturally. Tono led the vocals on Oh How I Love Jesus followed by Kaehulani on E Ho`olohe Mai.Hi`ipoi, who did most of the emceeing, was very humorous in her delivery, asking the audience to excuse Kaehulani’s shyness, “No Mind Her; she is still in training.” Many of the songs in the first half of the program were hymns with powerful voices in harmony –Dear Lord, God is So Good, Mai Kai Keakua and There’s a Roof Above Me. They also shared a number of songs by Mama Ane, Aloha Wau Ia Iesu and Ku’u Ho`omana. Hi`ipoi said that for years she made dinner and took it to Mama Ane, who is one of the premiere shell lei makers in Hawai`i. Whenever she went out to sing, she would ask Grandma if she could borrow her necklace and her `ukulele. One day Mama Ane called Hi`ipoi to her home and told her to look in the basket and choose one of the three leis in there. Each lei had its own name by the way the shells were sewn together. Hi`ipoi felt so blessed by the gift; Cousin Tono was wearing her lei tonight. Grandma said, “Now you don’t have to borrow my necklace every time you perform.” She still does but is very careful to return the `ukulele and the lei right after the performance. She called up Uncle Charlie Baker who happened to be wearing his very rare 10-strand, 42-inch long hot pink kahelelani shell lei called Lei Kahelelani `Akala Ikaika, sometimes called Waipapipi, one of the rarest of shells found on only two beaches. The shell is named after the hot pink blossom of the prickly pear. The leis are named after flowers or strung in the pattern of flowers such as pikake, crown flower, etc. because Niihau is too dry for flowers. The shells are their replacement for similar flowers or leis found on other islands. Hi`ipoi ventured to say that Charlie’s lei is the only one of its kind in existence in the world. She also introduced their soon-to-be-married friends from O`ahu who came to see them perform. Yay! Visitors from O`ahu! As rare as Niihau shells. During intermission, CD’s were given away to six lucky folks who had taken the time to fill out their participant forms. The Kamoa `ukulele was also won by a very happy Jim Golding of Saskatoon, Saskachewan, Canada. During the second half they asked cousin Poni`aloha to join the group. Her voice is exquisite as she sang two songs, one of them called Refuge. Hi`ipoi also sang Imi Au la `Oe by Queen Liliu`okalani which she entered in the “You think You Got Talent” Contest at Kaua`i Community College. Male hula was offered by audience request as young Kiwa`a, Master Keiki Hula Competition winner from Kumu Hula Leina`ala Pavao Jardin’s halau, gave a rousing performance of Hene Hene Ko`aka, the Rocking Chair Hula, with the exciting vocals of Uncle John Mahi. What an unexpected treat and what a voice! 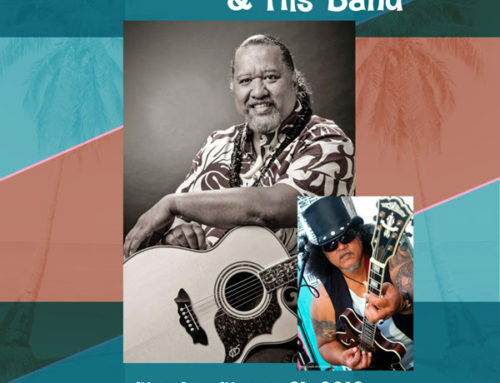 Check him out at Kalaheo Steak House. Not to be outdone in the hula department, a number of brave gentlemen came up to dance to an upbeat Maori song, E Papa, from Aoteroa with a Tongan hula about one’s big opu led by Naniwai`ui. Of course, no Niihau performance is complete without the famous song composed by the Reverend Moses Keale who survived his legendary fall from the high mountains of Kalalau to dedicate his life to God, thus building the Hawaiian Church in Waimea and the Church on Niihau. The girls could not resist throwing in their favorite reggae song called Sweet Love before all stood up, joined hands, and sang Hawai`i Aloha to end an authentic spiritual experience. It was an eye-opener to see how they do it on Niihau.